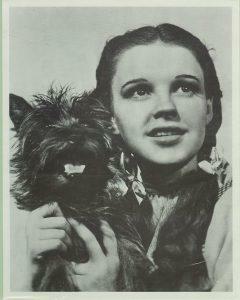 “Toto” is one of the most loved small dogs in movies and books. But what breed was Dorothy’s faithful sidekick? 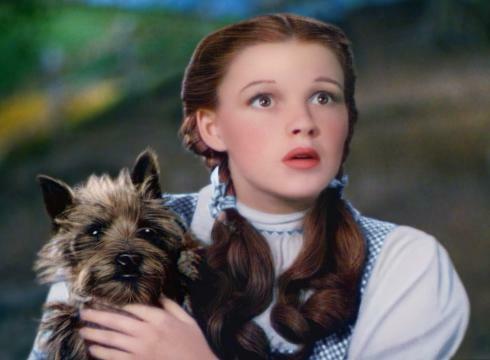 In the 1939 movie The Wizard of Oz, the part of Toto is played by a Cairn Terrier. 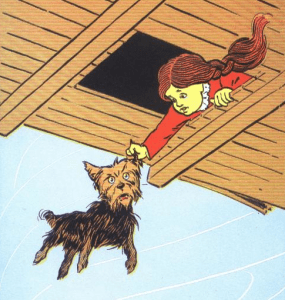 The dog’s breed is never mentioned in the original Oz books; however, based on the illustrations, it looks like Toto definitely started out as a Yorkie. Most of us first remember Toto from the 1939 movie The Wizard of Oz. 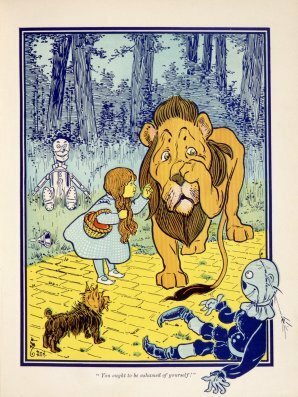 However this movie was based quite closely on a children’s book classic of the same name, published in 1900. The original editions of the wildly popular book were illustrated by W. W. Denslow who drew Toto as a terrier – but was it a Cairn Terrier or a Yorkshire Terrier? Denslow himself owned a Yorkshire Terrier, and when you look closely at the drawings you can certainly see “Yorkie” all over them! In the movie, Toto (which means “to make whole”) holds the plot together: he’s the loyal and brave pet who starts the journey and who travels with her while keeping the plot moving. It’s also interesting that Toto is the only dog in the Wizard of Oz books who does not speak. Metro Goldwyn Mayer made the story into the now classic movie The Wizard of Oz (1939) starring Judy Garland as Dorothy Gale. It was the first full length film in colour and is still aired at least once a year on TV stations around the world. Its rich imagery and symbolism, and the quest allegory keep it fresh. The part of Toto was played by a 6-year-old female Cairn Terrier called Terry (renamed Totoin real life after the popularity of the movie). Terry was a veteran film star, and appeared in 13 movies during her lifetime, starring with actors like Shirley Temple and Joan Crawford. During the filming of The Wizard of Oz, Terry was nearly killed when one of the witch’s guards accidentally stepped on her, breaking her foot. She spent two weeks recuperating at Judy Garland’s home, and Garland was reported to have grown quite attached to the dog. She wanted to adopt her, but Terry’s owner refused. The dog’s salary, $125 per week, was more than many human actors in the film; the Munchkins for example, only received $50 a week for their parts. Terry/Toto died in 1945 at the age of 12. The Wizard of Oz was remade many times over the years, always with a Toto. In Frank Baum’s later Oz books, Toto becomes a Boston Terrier for reasons that are never explained, but then changes back to a terrier in the last books of the series. Anniversary Edition of The Wizard of Oz is bound to be a real keepsake.